Categories: Bhagavatam Lectures, Sabari, Sri Thyagaraja. 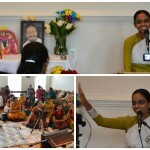 With the benign grace of Sri Swamiji, over 120 blessed devotees in Glen Allen VA, Centerville, VA and Germantown, MD witnessed and were fully drenched in the shower of divine lectures by Sri Poornima Ji from May 13-16 2015. On 15th May, at 6 pm at Vision Center, Glen Allen, VA, satsang started with kids singing Maha Mantra Kirtan and Sri Swamiji’s Madhura Gitams. 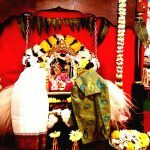 Then Sri PoornimaJi took the devotees on a time travel machine to the period when Saint Thyagaraja Swamigal was composing his everlasting kirtans on Lord Rama. 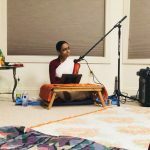 She beautifully articulated how he conversed with the Lord through his kirtans, she beautifully sang those kirtans, explained the meaning, what was his response when Lord Rama gave him a darshan, how sad he was when the archa murthy of Rama was taken away from him for a period of 10 days, how he reacted and celebrated when he got united back with the archa murthy. Finally she described how he attained Lord Rama’s charana. She beautifully elucidated the power of nama jaba, nama balam and concluded by emphasizing how easily one can attain moksha is the mahimai of the Nama. 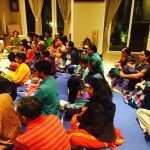 About 40 devotees attended the Satsang and the satsang came to a close with all of them singing Maha Mantra Kirtan. 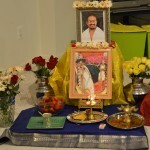 On 16th May at 11:30 am the residence of Sri Ganesh Ji and Deepa Ji at Centerville, VA, Sri Poornima Ji talked about Guru Bhakthi through the story of a hunter girl Sabhari who lives her life without any restrictions and wandered around the forest which is typical of the hunter clan she belongs to, until she gets a chance to be near the ashram of Sage Mathanga Maharishi. Sri Poornima Ji expressively detailed how Sabhari got the Rama Nama from her Guru Mathanga Maharishi, when she got it, how she kept on chanting the Rama Nama, how she prepared her small hut for over a decade until Lord Rama showed up on her hut, took her offerings and became a witness of her reaching the lots feet of the Lord to join her Guru Mathanga. Sri Poornima Ji, unequivocally explained, the greatness of Sabhari’s Guru Bhakthi. Her Guru Mathanga Maharishi was pleased with her devotion and Guru bhakthi and initiated Rama Nama Jaba to her, asked her to keep chanting the Rama Nama and that will bring the Naami, the Lord Rama to her door steps and then she will join him in the heaven. She continued to chant Rama Nama which finally made Lord Rama becoming a mere witness to her reaching heaven to join her Guru Mathanga. 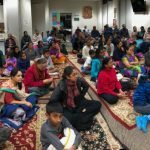 About 20 devotees attended the Satsang. The satsang concluded with all of them singing Guru Maharaj’s Kaliyayum Bali Kollum Kirtan and Maha Harathi. 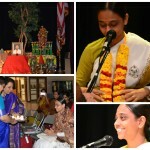 On 16th at 5 pm at Roberto Clemente Middle School, Germantown, MD Sri Poornima Ji gave a lecture on Bhakthi Yoga. 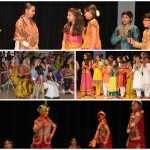 This was part of the Annual Day celebrations by Ragha Sudha Group. Sri Poornima Ji skillfully highlighted what is Bhakthi and Arjun’s Bagthi towards Lord Krishna, how he surrendered to Krishna when he was not sure what to do in the war. She went on to explain Bhakthi is the main part in the Bagavat Gita and that is why Bhakthi Yoga is kept in the middle of Karma Yoga and Gnyana Yoga. She showed several examples from our day-to-day life on how we always trust other human beings and various machines but we don’t trust the creator of this world, the Lord. She then concluded, when we overcome that state and start to trust on the Lord our Bhakthi will become complete. The lecture was attentively listened by over 50 adult devotees and over 30 kids. 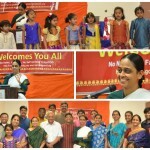 Sri Poornima Ji as the Chief Guest distributed awards and certificates to the kids who participated in the event. 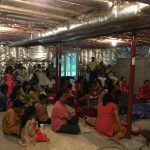 On 17th at 11:30 am at Sri Shailaji’s residence in Germantown, MD, Sri Poornima Ji gave a soul touching discourse on Saint Tulsidas Gosvami. Devotees attended were totally drenched on the divine life of Gosvami, his childhood trainings on Rama katha and Rama Nama initiation by his father, how affectionate he was towards his wife Ratnavali , how she turned Sri Tulsidas totally from the normal materialistic world to Bhakthi marga especially towards Rama. All the devotees enjoyed the nectar of Tulsidas Gosvami’s bhakthi rasa towards Rama and were elated with joy when Sri Poornima Ji explained the part of Gosvami having the Darshan of Krishna and Rama in Brindavan. Finally she concluded the discourse with the leela that Gosvami did to prove to the world that Rama Nama will purify sins of the person who chants it. With that the 3 days of constant shower of Bhakthi with the grace of our Gurumaharaj and Takur Ji came to an end.